First appearance "Mama Mia Mario"
Aunt Luigeena is the aunt of Mario and Luigi. She is played by Danny Wells, the same actor who plays Luigi. Near the end of The Super Mario Bros. Super Show! 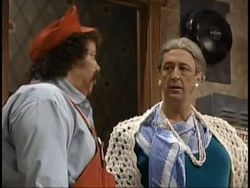 live-action segment "Mama Mia Mario", Aunt Luigeena appears at Mario Brothers Plumbing, apparently to visit Mario and Luigi. Shortly after arriving, she begins to berate Mario, who is dumbstruck and horrified to see her in his apartment.